I always love a good sale, and right now over at Teacher Pay Teachers that’s what is happening. I did my fair of shopping on day one and I always fill my cart up one more time for day 2, which happens to be today. So be sure to check it out and enter the promo code BTS14 at checkout to get some extra savings. 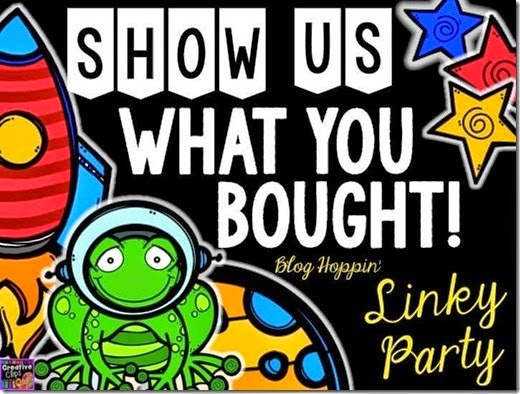 I am linking up with Blog Hoppin’ to share some of the goodies I bought. Reader’s Theatre Plays (Fall Version) by the Teeny Tiny Teacher- these are great for Daily 5 partner reading. I bought some of these last spring and my kids could not get enough of them. I am looking forward to this fall set. Setting the Stage 2 Engage by Hope King- I saw her session on student engagement in Las Vegas last month and it was absolutely amazing. This pack is great, it goes into much more detail of what she shared about at her presentation. Listen Up by Fluttering Through First Grade- I am so excited for these. We have a very old school busy bear listening and following directions activity pack. Back to School Clip Cards by Doodle Bugs Teaching- I have been wanting something like this for the beginning of the year for a while, and these are great for review while trying to teach Daily 5 and and math Daily 3 procedures. What did you buy? I love seeing what others bought because I often discover new things myself! You have a few more hours to stock up on what you may want or need for the new school year. Click below to shop some more! I love your cart full of items!